TRIUMPH’S Tiger Explorer is one of the few bikes that’s taking the fight to BMW’s R1200GS in terms of sales in the UK and next year it’s going to stand an even better chance thanks to a bunch of visual and technical changes. 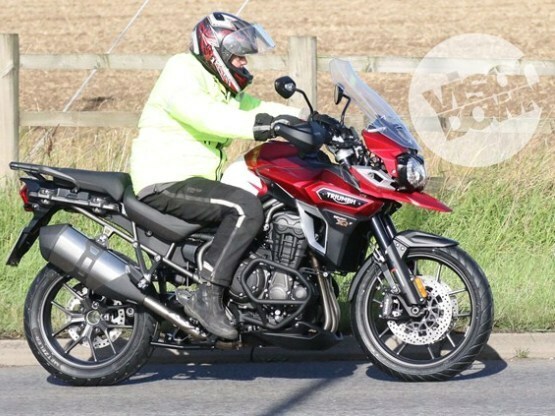 The range is to be reshuffled to resemble the six-model Tiger 800 line up, with three road-oriented bikes and a trio of wire-wheeled, knobbly-tyred models. Our latest spy pictures show that the bikes are now production-ready; the red bike is completely without disguise and wears a production-style colour scheme rather than the normal prototype black – perhaps Triumph has been shooting pictures for the bike’s brochure? It even carries ‘XRT’ badging, revealing its position at the top of the range of road-biased versions. The XRT is the touring model of the range and gains high-spec kit including WP’s semi-active, electronically-adjustable suspension. Lower spec machines including the base XR and mid-line XRx are unlikely to get the semi-active kit, but will feature the same styling and technical changes. These include all-new bodywork, restyled wheels and a revised engine including higher-spec electronics. The new radial-mount Brembo brakes have also been spied on lower-spec prototypes, suggesting they’ll be used throughout the range. Given that BMW’s R1200GS sales are fairly equally split between the road-oriented GS and the more rugged Adventure version, it’s not a surprise that Triumph is also set to offer three XC-badged models with wire wheels, a 19-inch front and knobblier rubber. Our spy picture shows a near-completed, but still unbadged and black-finished, range-topping XC – likely to be called the XCA or XC Adventure to mimic the Tiger 800’s most expensive variant. It also gets the semi-active WP suspension and the new styling but retains the wire wheels of the existing Explorer XC. In XCA form it’s clearly going to be peppered with bolt-on extras including panniers, top-box, crash bars, extra lights and probably a host of rider aids and creature comforts. Again, lower-spec XCs and XCxes will look near-identical but aren’t expected to get the semi-active suspension. The fact these bikes are so complete, particularly the ready-for-its-closeup Explorer XRT, suggests that the final unveiling could be just days away.